Burst brings paper over board products in house! In this digital marketing revolution, there has been a rapid change in marketing and communication planning. There are now many marketers who will dismiss direct mail and accuse it of being obsolete. The fact is though mail is still thriving! With the introduction of modern technologies, the way mail can be used has transformed and direct mail no longer has to be considered as just a piece of “junk mail”. With the availability of refined personalisation techniques and carefully targeted data, a highly creative DM piece should play a vital role in any integrated campaign. 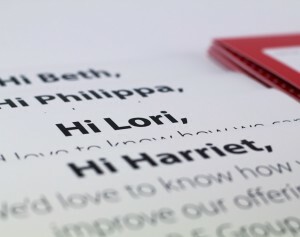 You may be surprised to hear it but many people actually miss receiving personally addressed mailings. Customers like to feel that they’re engaging in conversations directly with a brand and this can be done through DM. A well-crafted piece of personalised mail is hard to ignore and can be a direct entry-point into the consumer’s consciousness. As a result, it can create a pivotal moment in the customer journey. According to the Royal Mail, over 92% of all personalised mail in the UK is opened. Furthermore, a DM piece is essentially delivered directly to the customers’ hands so they’re virtually guaranteed to see your message. This fact shouldn’t be taken advantage of though. Time still needs to be spent ensuring that a personalised message is relevant to the individual. The more relevant the DM, the more likely it is a consumer will engage and respond. On average, 79% of people will act on a DM if they feel like it is personal and of value to them. However, only 45% of people said they would act on an email, so are you really willing to miss out on potentially reaching that other 34%? We are not saying that DM is the “silver bullet” and should be sent out as a standalone, but incorporating DM into your overall marketing strategy can act as a pull-through to get your customers talking to you. In conclusion, hitting them with a well thought out DM campaign could be the first step to breaking down walls for closer communication with your potential customers. We believe that combining print media with smart technology creates better campaigns. Using DM to compliment your campaign will allow you to open up channels to prospects and nurture them into a customer. In short, it can mean more conversions, more enquiries, and more sales. Using our digital printing capabilities, we can create those high-impact pieces that will stand out on the mat. Ready to up your marketing game? Talk to us today!